From 12-16 March 2018, the IUCN Marine Mammal Protected Areas Task Force (the “Task Force”) conducted the third Important Marine Mammal Area (IMMA) workshop in Kota Kinabalu, Sabah, Malaysia, on the island of Borneo. 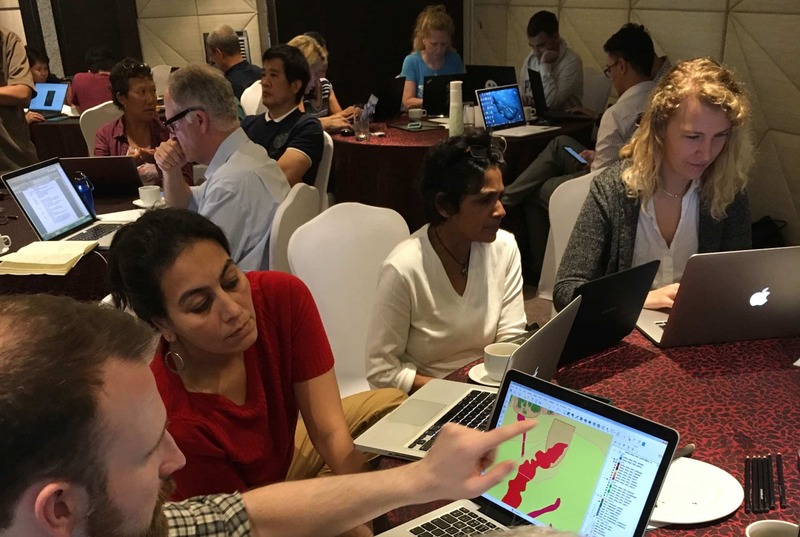 Covering the North East Indian Ocean and South East Asian Seas Region, this workshop follows successful IMMA workshops in the Mediterranean and in the Pacific Islands in 2016-2017. IMMA Co-ordinator Michael J. Tetley led the 34 marine mammal experts and observers from 17 countries as they worked through more than 100 areas of interest (AoI) submitted for consideration by workshop participants and members of the conservation community at large. From these preliminary AoI, the group merged 33 areas, deferred 11 others, kept 24 as AoI, and then prepared concise profiles for the 46 candidate IMMAs, proposing boundaries and detailing how each one met the IMMA criteria. The materials for AoI and cIMMA identification included valuable maps of MPAs and other conservation designations in the region as well as IUCN key biodiversity areas (KBAs) and CBD ecologically or biologically significant areas (EBSAs). Additional data layers depicted bottom topography with important features such as seamounts and continental drop offs, ocean currents and surface productivity. 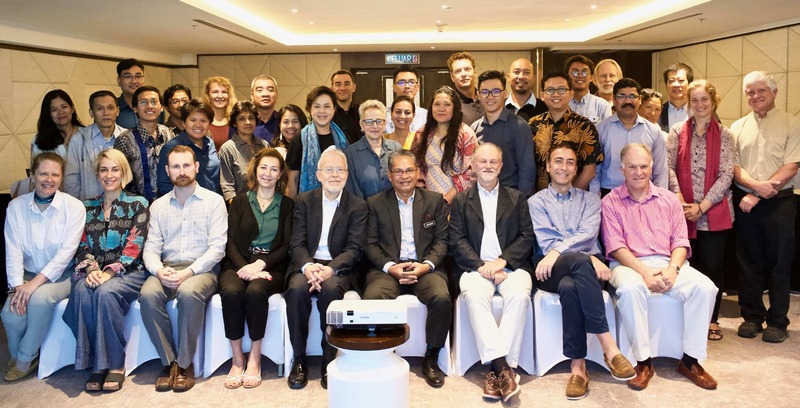 The third IMMA workshop region stretched from the east coast of India, Bangladesh, Thailand, Vietnam and the Philippines in the north to the vast Indonesian archipelago in the south. The experts identified sites for marine mammal species such as Indo-Pacific humpback and Irrawaddy dolphins, finless porpoises, Bryde’s and Omura’s whales as well as blue and humpback whales, and dugongs. The region includes the Coral Triangle, one of the most species-rich areas in the ocean, both for marine mammals and overall marine biodiversity. The preliminary results from the workshop will be announced as part of Task Force presentations at the European Cetacean Society annual meetings in La Spezia, Italy, 6-10 April 2018. Final results are expected to be posted online in September 2018. Important Marine Mammal Areas—IMMAs—are defined as discrete portions of habitat, important to marine mammal species, that have the potential to be delineated and managed for conservation. IMMAs are intended to act as a red flag spotlighting important habitat for marine mammals which may lead to marine protected areas (MPAs), ship or noise directives, marine spatial planning, and other conservation outcomes. But IMMAs also function as valuable indicators of health in the marine environment. They point to the location of umbrella species for protecting biodiversity, and can be used to monitor climate change. The Borneo workshop is the second in a strand of five southern hemisphere workshops (2016-2021) sponsored as part of the Global Ocean Biodiversity Initiative through the German government’s International Climate Initiative (GOBI-IKI). The other main supporter of the IMMA effort is the Eulabor Institute. Other sponsors of the worldwide IMMA project besides GOBI-IKI include the Tethys Research Institute, Whale and Dolphin Conservation (WDC), the MAVA Foundation, and the International Committee on Marine Mammal Protected Areas. The preparation of IMMA criteria and establishing support for the IMMA concept was funded by Animal Welfare Institute, Eulabor Institute, Tethys and WDC, among others. The workshop plenary was attended by the Permanent Secretary to the Ministry of Tourism, Culture and Environment in Sabah, Malaysia, Yang Berbahagia Datu Rosmadi Datu Sulai, as well as a number of marine mammal researchers working in the waters of Sabah. He acknowledged the importance of the IMMA work. The opening talks were by Task Force co-chairs Erich Hoyt and Giuseppe Notarbartolo di Sciara as well as David Johnson, from the Global Ocean Biodiversity Initiative, in the UK, who gave an overview of the six GOBI-IKI projects of which the IMMA project is one, as well as his work with OSPAR and the CBD EBSA process.